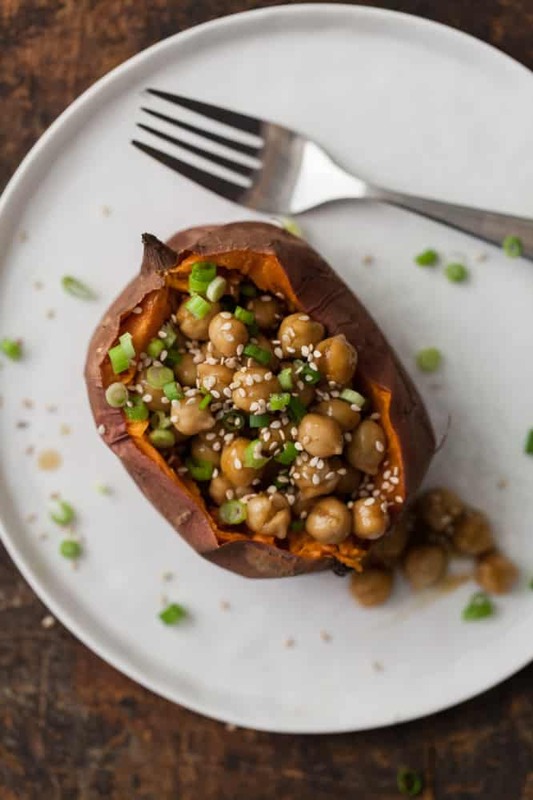 Teriyaki Chickpea Loaded Sweet Potato | Naturally. At any rate, I keep a bottle of teriyaki on hand for a good stir fry, but it works so well with this recipe. Also, I recommend making your own at home- it’s fairly simple and you can keep the ingredients simple! In a sauce pan, combine chickpeas and teriyaki sauce. Cook over medium-low heat for 6-8 minutes until sauce is warm and chickpeas are starting to make a popping sound. I would never have thought of this combination but I’m sure I’d love it! Love this idea. I can never get enough sweet potatoes! Yum! Oh my gosh, this is so smart!!! You are brilliant. This sounds really good! Unfortunately, I’m not supposed to eat chickpeas. Do you have a suggestion for a chickpea alternative? Thanks! “Why have I not thought of this?” says the girl who goes through 3 cans of chickpeas alone in a single week. Erin, you are a genius. This looks amazing and the teriyaki sounds great – I would have never thought of it! I had to laugh at your comment about being so overwhelmed you don’t know what to write. I understand the feeling. Fortunately these pictures can do the talking for you because it looks amazing! I typically eat my baked sweet potatoes (which I love) plain, but stuffing them is a great idea! The sweet from the potato and the salt from the teriyaki sounds like a great combination! I’m on board with anything containing chickpeas. But adding it to teriyaki and sweet potato is genius – sweet, salty, good bite. Loving this combo! It looks so simple but so delicious! Lools like a perfect lunch to me. This is so comfort food for me! 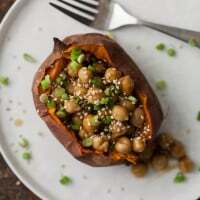 Baked sweet potato is just so warming and delicious. Absolutely love it! this looks lovely!!! but my local grocery store and farmers market don’t carry sweet potato—only yam. would yam be an okay substution???? This looks like the perfect work-from-home lunch! Love it! I have been eating this dish for lunch this week. It freezes and reheats beautifully, but my sense is that perhaps BBQ sauce might be a better pair with the sweet potato. Sort of like a Southern BBQ style dish. In any case, easy peasy for lunches. BBQ sounds interesting. Have you tried it yet? Actually, I think there might be many sauces good with this — like salsas (hot, med or mild)! Or a cheesy sauce. 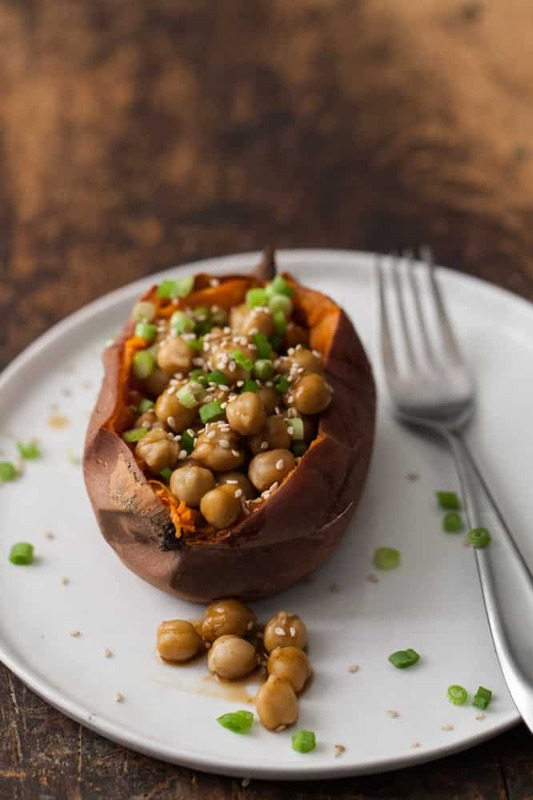 Sweet potatoes and chickpeas together?! Those are my two favorite foods. I can’t believe I haven’t thought of this! I’ve seen this making it’s way around Pinterest. Of course you were behind it! Looks perfect for fall, comforting and satisfying. Thanks for sharing!! Made this for dinner tonight. One of my kids actually stood up and applauded! I added carmelized onions and some kale because it looked pretty and gotta give us some green. Yum and thank you. Made this for dinner tonight and we all loved it!! Keep the yummies coming. I tried this tonight and it turned out great! Like one of the other commenters here, I added caramelized onions as an added bonus and YUM!